Age: 37 / 10 years service. Walter E. MacAulay was Married with 1 Child. 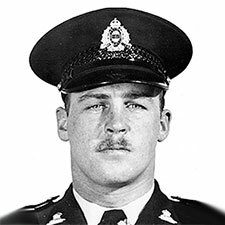 On April 4, 1964, while off duty and downtown with his 5 year old daughter, Constable MacAulay went to the assistance of a fellow officer who was trying to arrest a motorist. MacAulay's arms were trapped in the door of the car as the suspect drove off. He was dragged 500 feet before being impaled on another vehicle's tailgate section. He died the following day of injuries received. The suspect was later sentenced to 7 years in prison following a conviction of criminal negligence causing death.